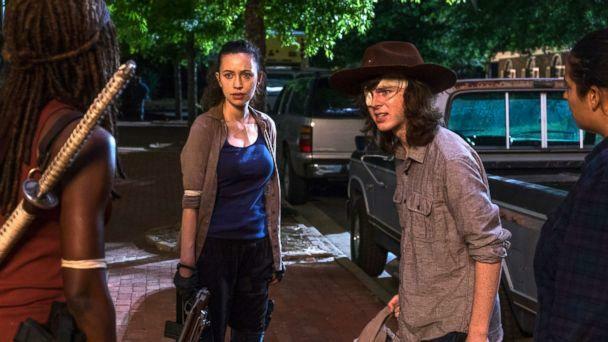 Sunday night's midseason finale of "The Walking Dead" began with Rick stunned, trying to find out what happened to the Sanctuary — and ended with a shocker. Second Warning, this is a fast-paced recap of events, to mirror the shocking, disjointed episode. Rick's moment is interspersed with a flashback to Carl discussing what needs to happen next. In the present, with Jadis and her people, Rick searches the Sanctuary, until someone opens fire. Jadis and her people beat feet, stranding Rick behind enemy lines — until an SUV with Carol and Ezekiel's pal Jerry shows up and rescues him. Rick, Ezekiel, Carol and Maggie all look on pensively in their various locations, until the scene focuses on one person smiling. It's Negan, whistling his Savior wolf whistle. Meanwhile, Enid and Aaron are on a stretch of road, driving to Oceanside, to try to get the female-only colony to join them. They take a turn at a distillery, to perhaps find a welcome gift. At Alexandria, Michonne apologizes to Daryl for not joining his assault. Elsewhere, Carl tearfully writes his dad a letter. Aaron and Enid continue their trip to Oceanside — this time with one driving a huge whiskey truck. They park and, a short time later, they're awakened by a sound. Aaron goes to investigate and he's knocked down. Tara panics and fires — and kills Natania, the old woman who runs Oceanside. 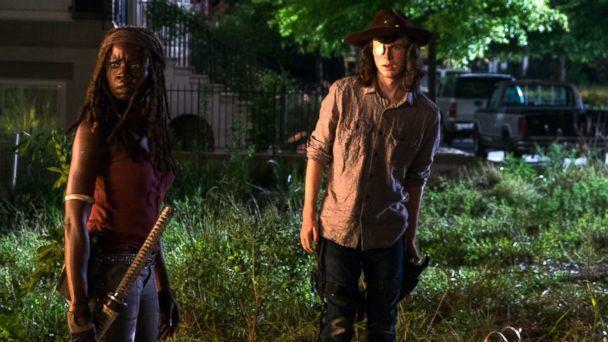 Michonne finds Carl, who appears to be leaving through a manhole. Just then, we hear Negan at the gate: He's demanding an apology and "the person with the lamest one dies." He's also demanding they open the gates. Meanwhile, Rick, Carol and Jerry are speeding down a road in separate cars, when Jerry is rammed out of frame. At the Kingdom, Ezekiel reads an apology note from Jerry, for leaving him. Just then, a sound. Men stream into his headquarters. Also driving, Maggie is confident with Jesus that they'll be able to starve out the Saviors in in the stricken Sanctuary. Just then, they spot a tree blocking the road. In short order, a truck backs up. Two men come out, along with a lower a ramp and a coffin. Simon, Negan's right hand man, emerges. They roll an injured Jerry down the ramp. At Alexandria, Rick's gang prepares for the assault. Carl has a plan in mind, but it doesn't include fighting. He's in charge. At the Kingdom, one of Negan's lieutenants informs the rest that everything they make will now belong to the Saviors and since they caused the Saviors' home to be overrun, they'll be living there. With Maggie, Simon informs the rest they have to give up their guns or Jerry and their comrades in the cars will be executed. Back at Alexandria, Negan is on the mic and learns Rick isn't home — from Carl atop the gate. Carl says he's willing to sacrifice himself to change the course of things. Just then, Daryl guns a garbage truck's engine, and rams Alexandria's gate from the inside, with a series of other cars and trucks in tow. They speed away. Carl ducks away and Negan realizes he's been had. Negan's guys fire grenades into Alexandria. Carl, meanwhile, throws smoke grenades to try to confuse the invaders. Around him, the homes explode. On the road, Simon threatens Maggie, who tells her they've decided Hilltop, her community, can stay intact if they keep producing. Simon executes Neil, who was riding with her and Jesus, to prove a point. She agrees to turn around, but as a favor, she asks for the coffin to bury Neil. "Favor granted," he smarms. In the woods, Michonne, Rosita and the other Alexandria fighters wait for an ambush. On the road, Dwight tells the savior Laura to go a little further, against her better judgment, into the smoke. Just then: ambush. Dwight hides while the rest of his men fire back at Rick's gang. Then Dwight opens up on his own men. Laura sees him do it and now knows he's the traitor. She fires, hitting him in the shoulder. She blames him for everything that happened, but before she can execute him, she takes fire and scrambles away. Back at Alexandria, Negan and his gang look for the folks, only to realize they're gone. But he suspects Carl would "go down with the ship." He gives orders not to kill Carl, but find him. Carl, for his part, hides in the sewer. A guilt-wracked Eugene, at the Sanctuary, decides to help the doctor get back to Maggie to help her through her pregnancy; he said he slipped laxative into a guard's coffee, providing an escape route, and also conveniently drops a set of car keys for the doctor. Ezekiel lights a fire to distract the Saviors, who have orders to keep him alive, at the Kingdom. He rams a school bus through the streets, enough for one of his to grab survivors and shuttle them away. Maggie appears at the gate. "Save them," he tells her. "Like you saved me." Ezekiel locks himself inside and surrenders to the Saviors. Maggie has finally returned, at Hilltop. She shows up to the Savior pen and demands one, Dean, step out. She executes him on the spot. It doesn't make them even with the Saviors, but she says, "It's a start." She demands they fortify the walls and prepare for a last stand. Back at the roadside ambush, Dwight calls out that it's over. He explains to the gun-toting good guys that he can't go back — and explains it was Eugene who got them clear of the walkers surrounding the compound. Uneasily, they agree to keep him alive — though Daryl reclaims his vest. At Kingdom, Morgan materializes. Outside Alexandria, Rosita and the other fighters disappear into the sewers. Michonne refuses to go with them, and covers the manhole. Inside Alexandria, Rick is looking for Carl when Negan attacks him. They fight hand-to-hand-to-Lucille. Rick momentarily gets the upper hand, and manages to escape through a window. Michonne stalks through the town and butchers a Savior. Rick finds her and together they get to the sewer, where one by one, Rick finds all the survivors, including baby Judith, and eventually Carl, who tells him he led them all there. Then Carl pulls up his shirt. Somewhere along the line, he got bit. 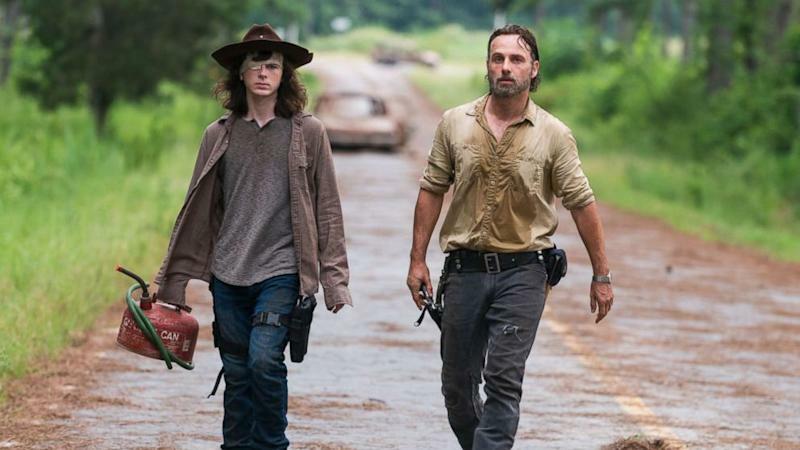 "The Walking Dead" returns for the second half of season eight on February 25 on AMC.